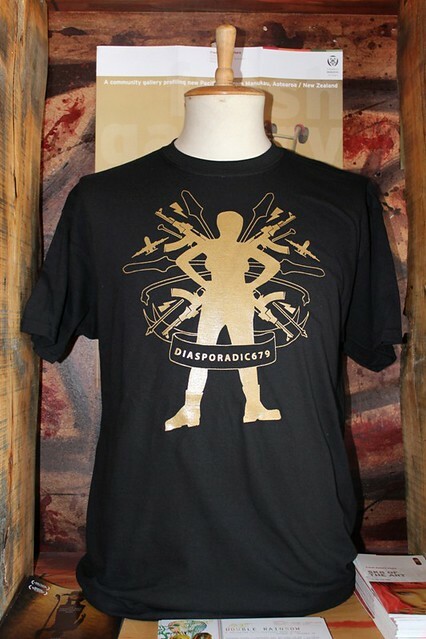 The diasporadic679 T-shirt is beautifully printed by South Auckland’s excellent PopoHardWear – the logo is gold, large-scale and fabulous. 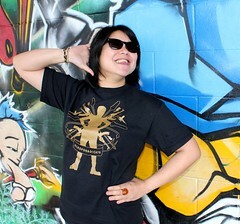 The T-shirts support the exhibition project costs and are only NZD40. Please contact Nicole Lim at Fresh Gallery Otara for sales enquiries or drop in between 10am – 5pm, Tuesday – Friday; 8am – 2pm, Saturdays. 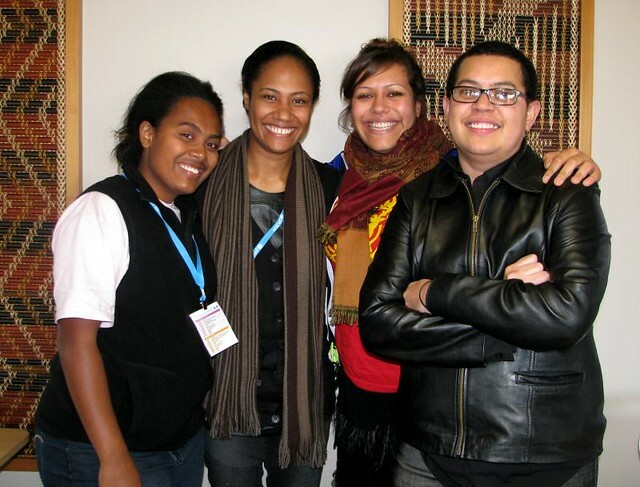 Fiji women were 100% present at the recent UNICEF Youth Congress held at Te Manukanuka o Hoturoa Marae in Auckland. I spoke in a panel about art as a platform for social activism, after sessions by Sainimere Veitata, Co-chair of the Econesian Society at the University of the South Pacific (Suva, Fiji) and Merewalesi Nailatikau, UNICEF Regional Goodwill Ambassador. Merewalesi was crowned Miss Hibiscus and went on to be the first Fijian woman to take out the Polynesian-dominated Miss South Pacific beauty pageant in 2009. She is brains + beauty in a big way! 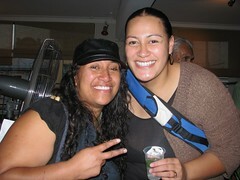 My South Auckland comrade, Luisa Tora, came to support. 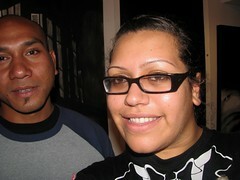 Luisa and I are working on an upcoming project to commemorate Fiji Day in the South Auckland suburb of Otahuhu. 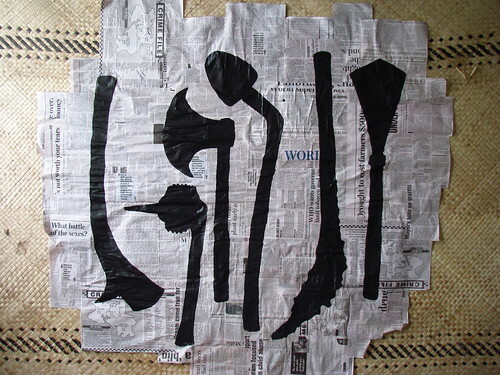 In an exhibition of posters featuring artwork by 7 Fiji women artists, diasporadic679 will be installed in the windows and public spaces of 6 venues over 9 days. 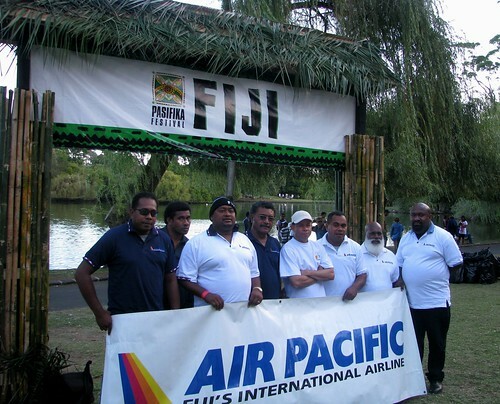 The numerical reference is to Fiji’s international telephone prefix. 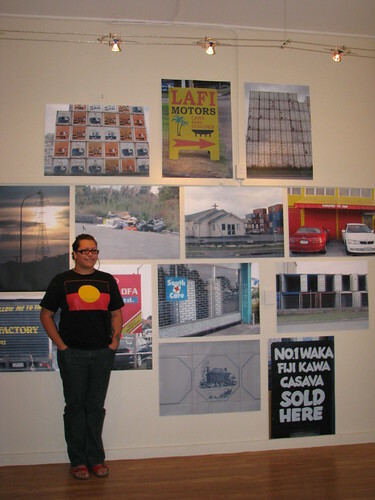 The exhibition will be part of the newly re-branded Southside Arts Festival (previously Manukau Festival of Arts) which runs from 14 October – 6 November 2011.
diasporadic679 takes its name partly from Luisa Tora’s made-in-South-Auckland zine, diasporadic and represents an ongoing relationship between Fiji women artists Sangeeta Singh, Margaret Aull, Torika Bolatagici, Dulcie Stewart, Tagi Qolouvaki, Luisa and myself. 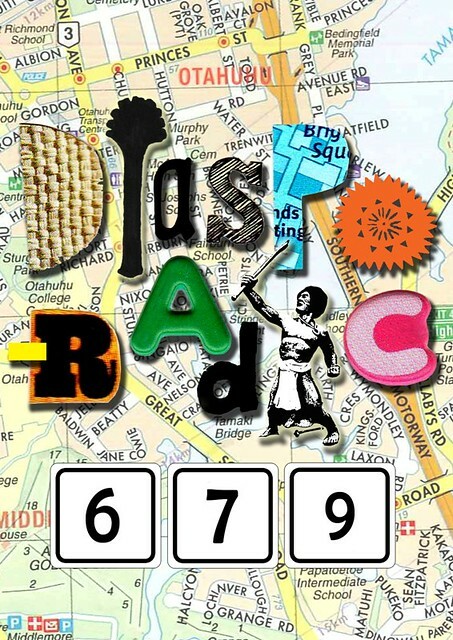 The diasporadic679 blog has just been established and will be updated daily leading up to the project which runs from 17-25 October. 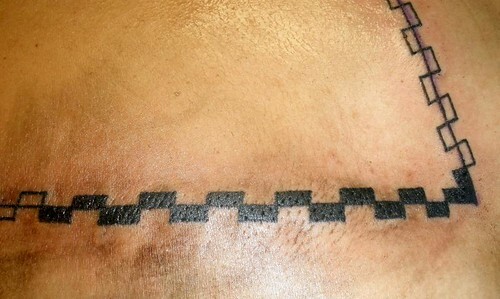 My niu tattoo… just completed by Joe Brown at Nesian Tattoo, Mangere. 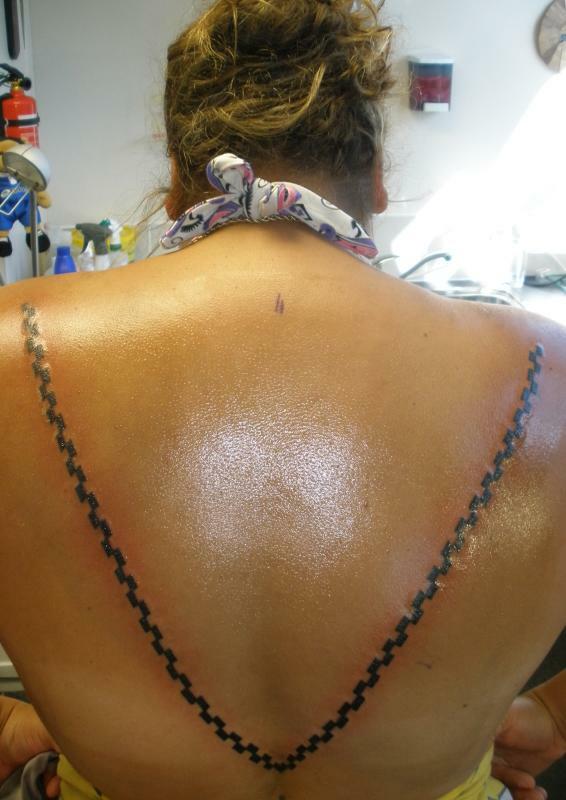 I’m learning to tattoo so have been researching Fijian tattooing – this design is inspired by Fijian women’s tattoo. As well as Craig Marlow and Lambert Ho, travelling with the Pacific Arts Alliance this band performed in the Fiji Village at the annual Pasifika Festival in Central Auckland, New Zealand (Saturday 8 March 2008), part of the annual Auckland City Council Celebrate Pasifika festival. A new exhibition of Pacific artists is inviting people to take another look at the contrast of white and black, the personal expression of identity and wider issues of race and ethnicity. 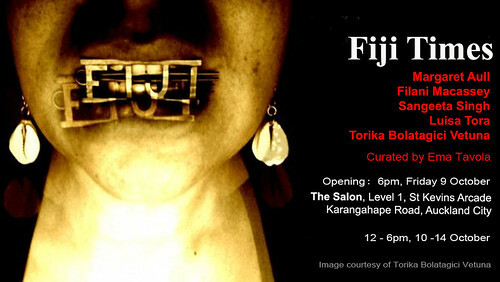 ‘Flat White, Black Pearl’ is being shown in Auckland as part of the month-long Celebrate Pasifika festival. 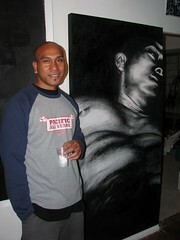 Atypical of your usual expectation of Pacific culture in the visual arts, it will only feature works that are in black and white. 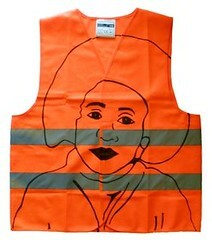 With almost 50 artists participating in the show, there are bound to be a few surprises about how the artists have chosen to express their ‘colour’ and cultural identity when confined to neutral tones. 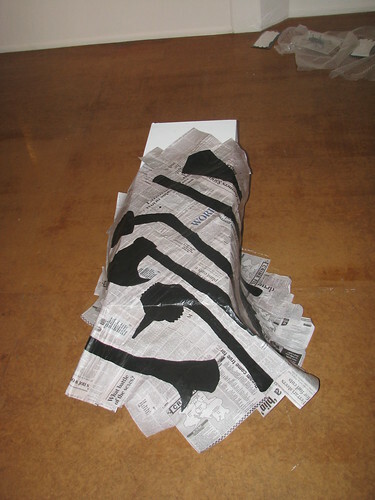 “Work has been selected because it is black and/or white, or shades of grey,” explains Jim Vivieaere who has curated the exhibition along with Leeane Clayton, herself an emerging artist and first-time curator. 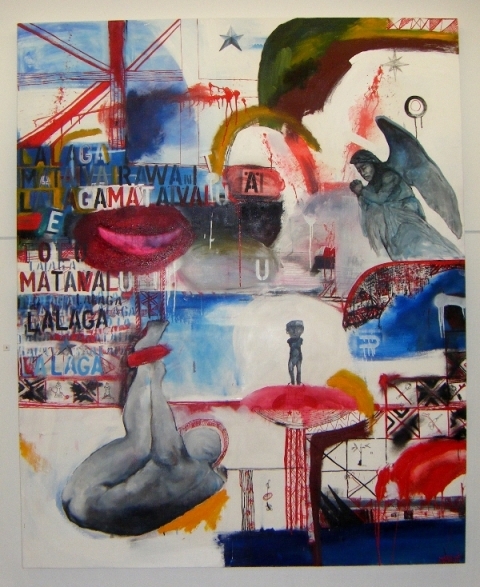 While the curators concentrate on creating the physical and intellectual experience of the exhibition, the artists determine their own views on issues of race and identity as Pacific artists. In ‘Flat White, Black Pearl’, although there may be a “colour bar” on the artwork – limited to shades of black, white and grey – there are no limits as to how innovative, expressive, white or black, ordinary or gorgeous the artists choose to be. 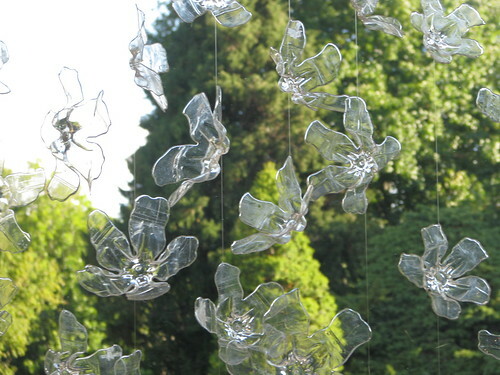 The exhibition runs from 1 – 22 March at Te Karanga Gallery on Karangahape Road, Auckland. 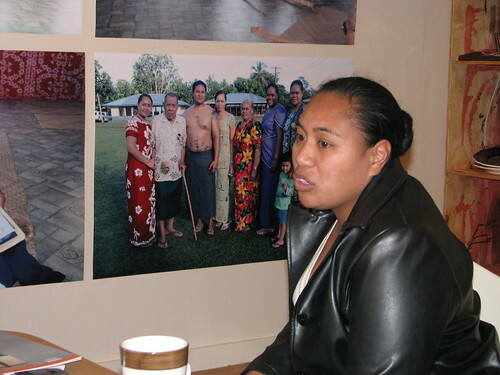 This exhibition is a Tautai initiative, supported by funding from Creative Communities and part of Auckland City Council’s Celebrate Pasifika 2008. 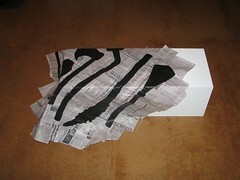 Jim Vivieaere has had a long and illustrious career as an artist, curator and commentator. 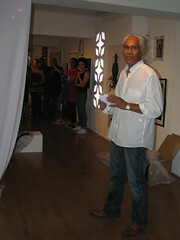 Particularly remembered for his exhibition ‘Bottled Ocean’ which was the first survey exhibition of Pacific Island contemporary art. 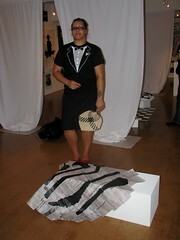 Leeane Clayton is an emerging Pacific Island artist and first-time curator. 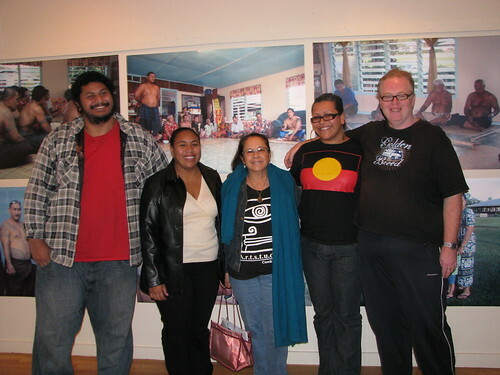 Tautai Contemporary Pacific Arts Trust was established in the 1980s to mentor and support contemporary Pacific art and artists. 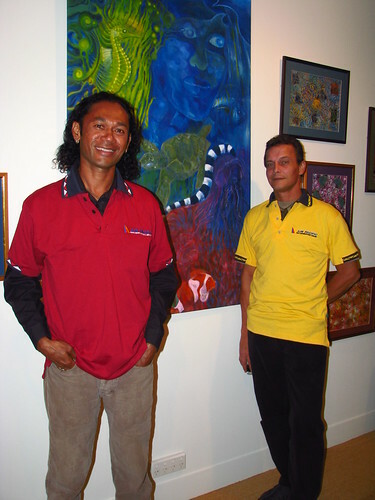 As a charitable trust it continues to pursue its goals through promoting and providing profile to Pacific heritage artists and their work. 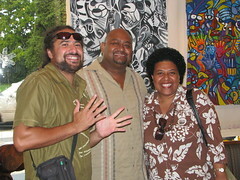 It operates on the understanding that the artists remain independent of Tautai and come together through the Tautai connection to participate in art events.